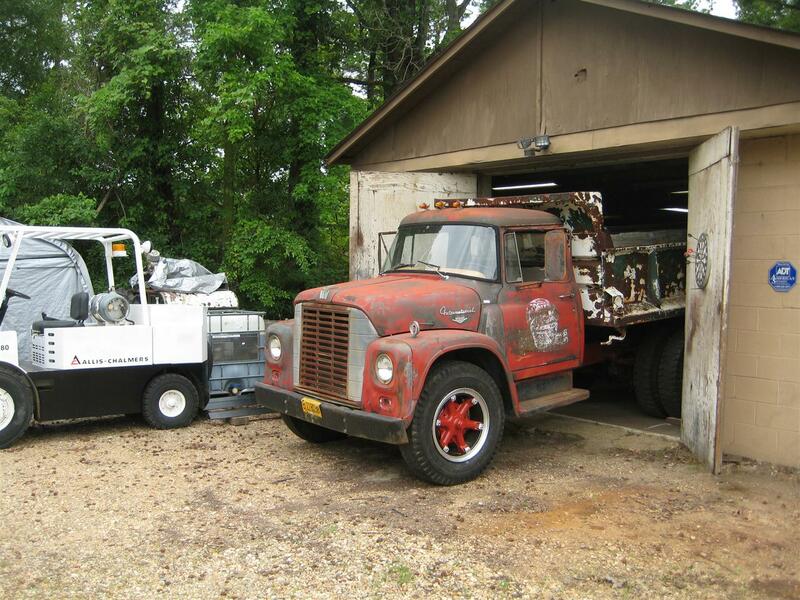 Metal that is in constant contact with dirt and moisture tends to rust. Dump beds are no exception. They are constantly handling various types of dirt which embeds itself in the many joints and cavities within the construction of the hoist body. The dirt absorbs moisture and holds it directly on the metal which then rusts. Rain water also collects in the bed if not kept at an angle when parked. This, along with left over dirt material in the bed, generally causes the floor to rust out first. My Loadstar is on its second floor, which isn’t too bad for a 1966 model. However, had it been cared for properly it would be in much better shape. The original floor is made of plate steel. 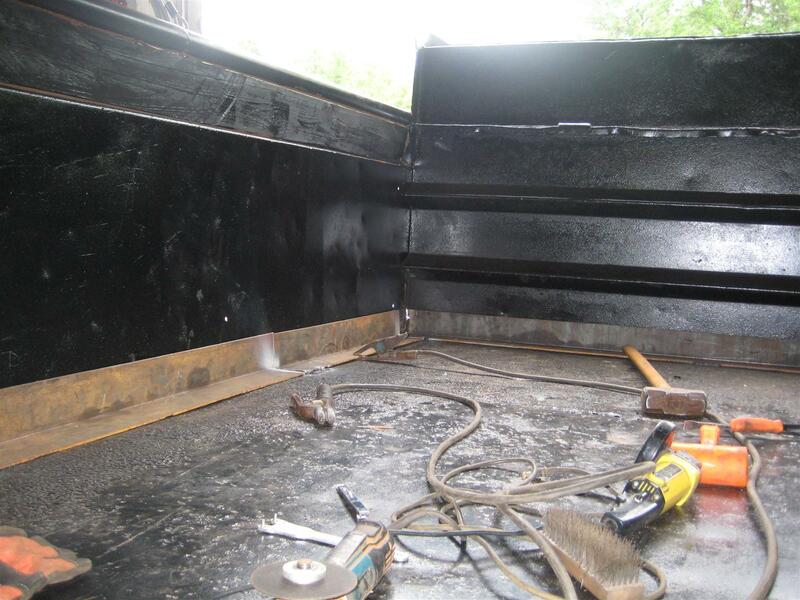 Typically, once it wears out most people would install new plate steel either by first cutting out the old floor and welding in the new material or by laying the new plate on top of the old plate and welding it in. 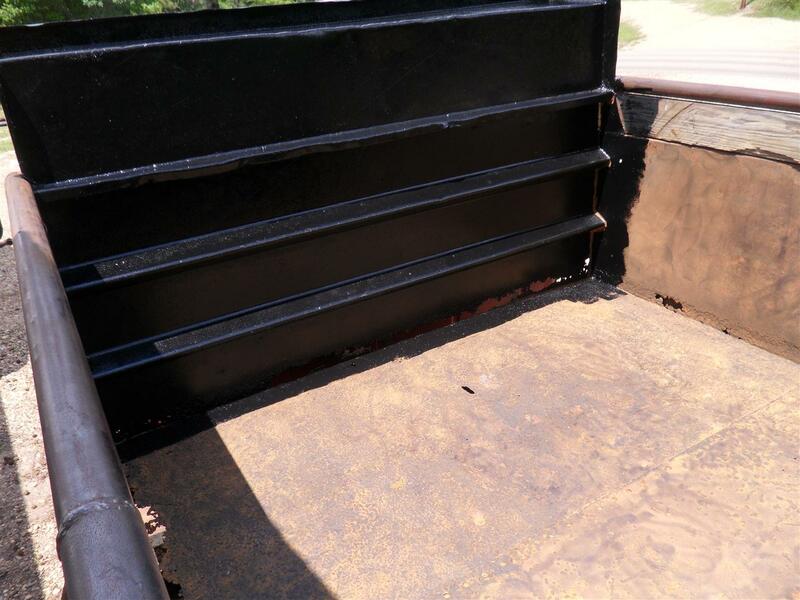 In this case, when the plate floor wore out, rather than installing costly new plate, the previous owners used very old oil field tank metal. When I say “old” I mean it is from the era before welded tanks. This is a type of metal that is thinner than plate and is rolled into the shape of a cylinder and bolted or riveted together at the joint. They took this metal from an old tank and attempted to flatten it out and use it in place of plate steel. They couldn’t quite get it flat enough, so the floor isn’t totally flat. Since it was already so thin, it didn’t last too long either. Now I don’t fault them for using materials on hand to reduce costs; I do that all the time. 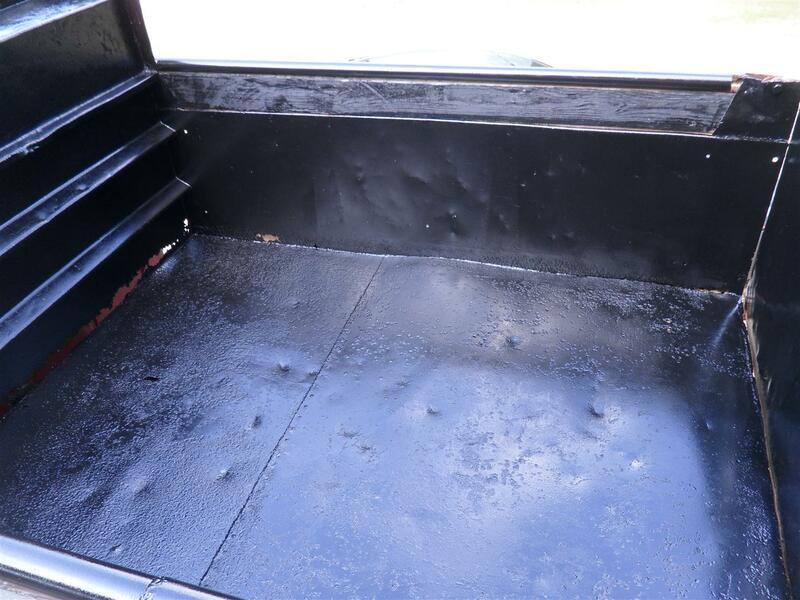 However, they made no attempt to clean, maintain, or service the bed, or any other part of the truck for that matter. Compounding things, when they took the truck out of service they left a few inches of sand and debris in the bed for several years. So by the time I cleaned out all the crud, it looked as you see in the photo below. The most proper thing to do would be to cut out the bad parts, sand blast the rest to bare metal, then paint, etc. I don’t have the resources to do that on this project, so we’ll be taking a slightly different approach. First I use a knotted wire brush on my angle grinder to strip away as much dirt and rust as I can. Then, once I was covered from head to toe in rusty dust, I washed the bed with a water hose before using compressed air to blow out as much of the left over dust as possible. Once dry, I began sealing the inside of the bed with very thick coats of industrial enamel applied with a brush and roller. Since I didn’t have the means to completely remove all the rust, my intention was to seal as much of it as I could. While this wouldn’t be acceptable for a show-quality job, it will work just fine for my purposes. Next I focus on structural repairs. 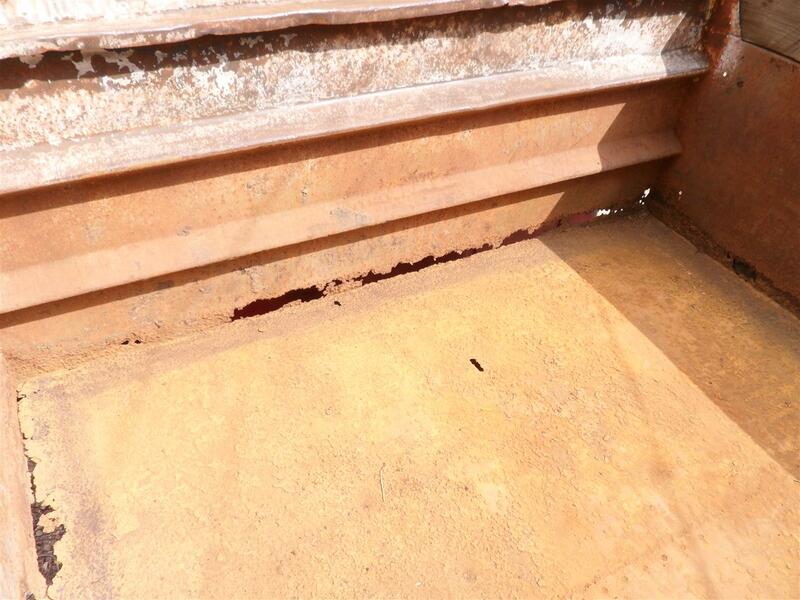 Most of the rust holes are focused at the front and the joint where the floor meets the sides. The middle portion of the floor, albeit thin, is still functional. I decided to run 1/4 inch thick 4 inch angle across the front and down the sides. This will improve the structural integrity of the bed and cover the big holes. My friend Philip hooked me up with some long pieces of 1/4 inch plate 8 inches wide. He had it bent into 4 inch angle iron. I sealed the bottom of each piece before installation. 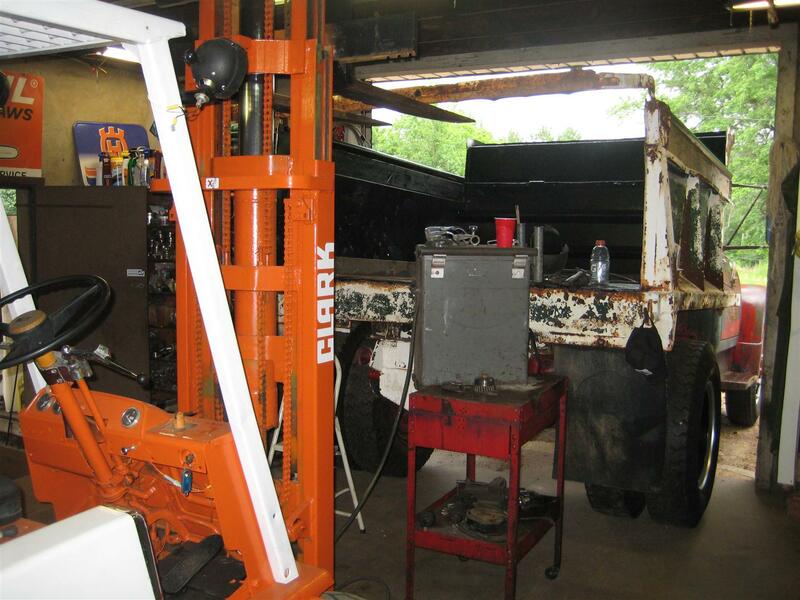 Once painted, I backed the truck up into the shop to begin the repairs. I use my Clark forklift to hold up the tailgate so I’ve got easy access to the bed, then I retrieve my oxy-acetylene rig to cut the pieces to the correct length and of course my antique Westinghouse welding machine to install the pieces. My welding machine is in questionable condition, but it’s all I have. I made it work pretty well in this case as the repairs turned out OK. I did however encounter a challenge fitting the straight pieces of angle iron into the base joints of the inside of the bed. The floor was not perfectly flat as previously discussed, and also the sides of the bed had bulged out a bit from the thousands of heavy loads it has hauled. 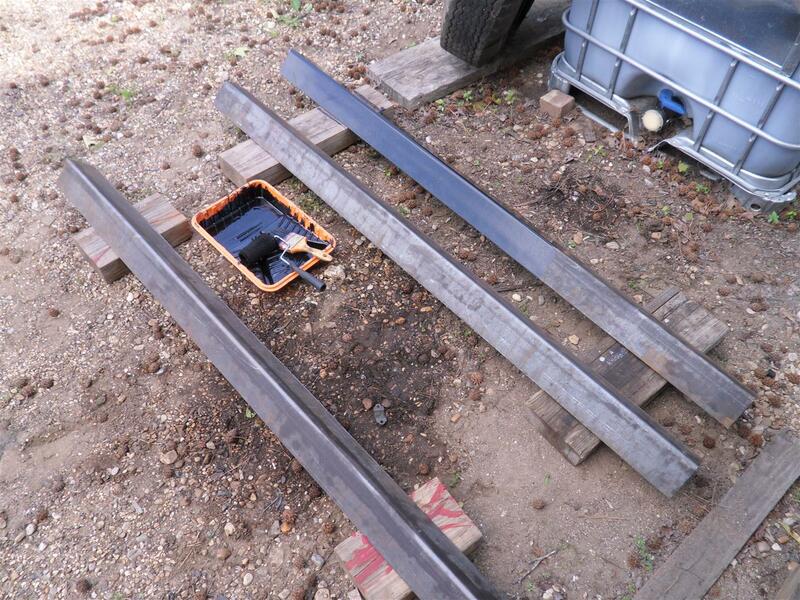 To remedy this, I cut the angle iron into shorter pieces, butted them together and welded them in. Then to fill in any gaps, I welded in filler metal. For filler metal, I took several long 5/8 bolts that I had in the scrap pile. I cut the heads off the bolts, essentially making them into studs, and laid them in the gaps and welded them in. I used industrial sealer to fill in any remaining gaps to hopefully dissuade dirt from packing itself into the cracks and holding moisture.